This article is about the Khajiit in Redwater Den. For generic bandits, see Bandit. For other uses, see Bandit (disambiguation). This Bandit is a male Khajiit found in Redwater Den in one of the booths set up for enjoying Redwater Skooma. 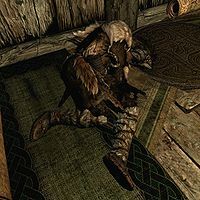 He is lying on a bedroll coughing, surrounded by empty skooma bottles and will never move from it. If you attempt to interact with him, you will receive the message "This person is busy." He wears leveled light armor, leveled light boots, and has a 50% chance of wearing leveled light bracers. This NPC's displayed name may be different for different players. He can appear as "Bandit", "Bandit Outlaw", "Bandit Thug", "Bandit Highwayman", "Bandit Plunderer", or "Bandit Marauder". This page was last modified on 28 March 2014, at 23:37.